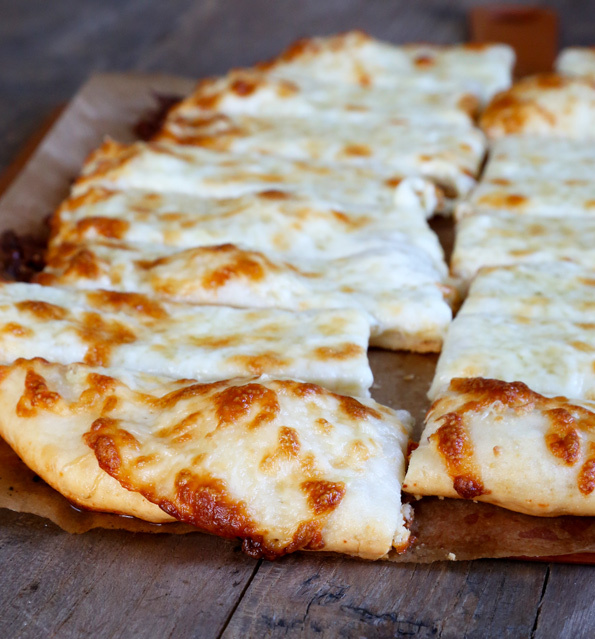 Garlic Gluten Free Pizza Bread Sticks | Great gluten free recipes for every occasion. 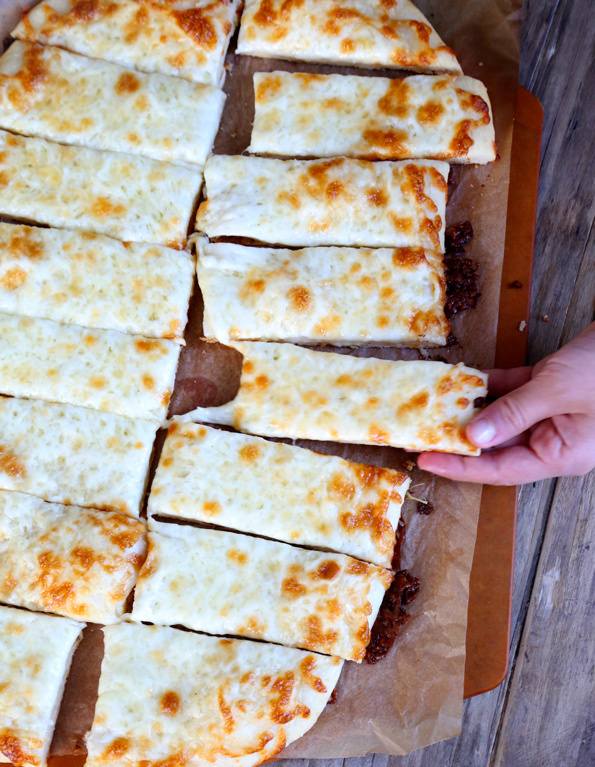 Whether you’re missing Pizza Hut breadsticks or just want some really good pizza dough covered in cheese and spices, these gluten free pizza bread sticks are everything! Going gluten free way back in 2004 has had its ups and downs, for sure. And from time to time, I do still feel a bit weepy when everyone else is talking about picking up a pizza for a quick weeknight dinner. But if you’ve got a bucket of gluten free pizza dough slowly proofing in the refrigerator, I bet you could have a piping hot pizza on the table in less time than it takes to pick up a takeout pie. You know that recipe for Thick Crust Gluten Free Pizza? Well, it’s a major opportunity to both feed your hungry family while you’re busy making a big holiday meal. It’s also a perfect appetizer to throw together for a big gathering. I consider my thick crust pizza dough recipe to be the savior of all things. And I know that some of you have issues with the 12 hours that I recommend storing the dough in your refrigerator before shaping it and baking it, so you really don’t have to do that if you insist (see the recipe instructions below). Even though a long, slow refrigerator rise might be unfamiliar to some, I promise that it’s a time-tested way to proof bread dough. It’s not some weird practice, and those 12+ hours, if you choose to go that way, mostly just mean that you can have pizza dough at your fingertips at a moment’s notice. 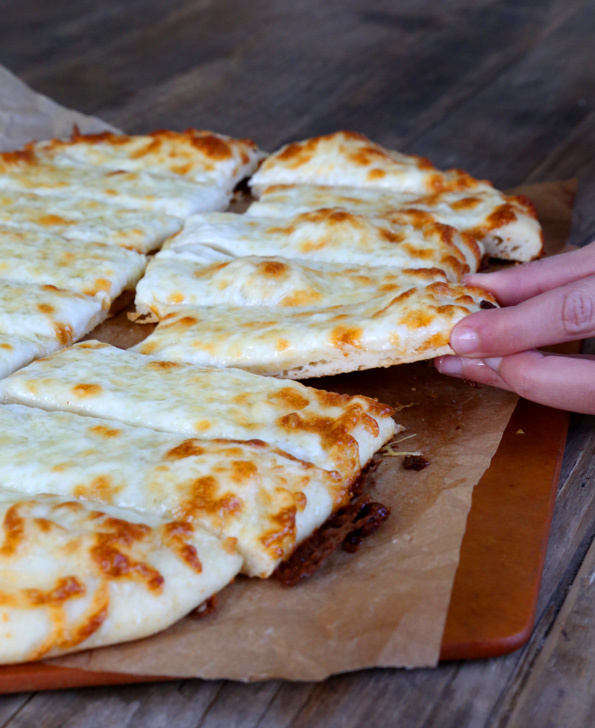 The thick crust + tons and tons of cheese + garlic pressed into a gorgeous paste = pizzeria-style pizza breadsticks. If you’re in a rush, though, this recipe would also work great with my yeast free gluten free pizza crust recipe. Make the pizza dough according to the recipe instructions and place the dough in a sealed container or bowl in a warm, draft-free location to rise until nearly doubled in size (1 to 2 hours, depending upon environment). Full doubling is not necessary. Place the risen dough, still in a sealed container or bowl, in the refrigerator to chill until firmer (about 30 minutes). Alternatively, set the dough to rise in a sealed container in the refrigerator for about 12 hours or up to 5 days. Shape the pizza dough. Place a pizza stone (or overturned rimmed metal baking sheet) on the bottom rack of your oven and preheat the oven to 400°F. On a lightly floured surface, knead the pizza dough until smoother as directed in These General Shaping Tips. Roll the dough into a ball. Sprinkle lightly with flour, and, using well-floured hands and a rolling pin, as necessary, pat and roll out the first piece of dough on a lightly floured surface into an oval shape, about 12 inches x 15 inches, rotating the dough and flouring it frequently, to prevent sticking, as shown in the gluten free pizza shaping video. Transfer the round of dough to a piece of unbleached parchment paper. Prepare the pizza. Using the flat side of a large knife, press the minced garlic and kosher salt together firmly to form a thick paste. Add the garlic paste to the melted butter, and mix to combine. Using a pastry brush, brush the entire surface of the pizza dough with the entire garlic butter mixture, all the way to the edges of the dough. Sprinkle evenly with the grated Parmigiano-Reggiano cheese, followed by the grated mozzarella cheese, all the way to the edge of the dough. Bake the pizza. Place the crust, still on the parchment paper, on the hot pizza stone. Bake until the crust is browned and the cheese is melted and browned in spots (about 10 minutes, but time will vary depending upon how crisp you’d like the crust). Allow to set briefly before slicing down the length in the center and then across into sticks, 8 sticks per side, and serving. Adapted from Baked By Rachel, as chosen by you from my Must Make Gluten Free Pinterest Board—in a big way! P.S. If you haven’t yet, I hope you’ll consider picking up a copy of Gluten Free on a Shoestring Bakes Bread! Let’s teach the world how gluten free pizza should taste! For making pizza, I really prefer your thin crust (from the bakes bread book.) Any reason not to use that one for this recipe? Totally in love with your pizza dough (with a tad more water for the dry Midwest) and I love this recipe. Good idea for an appetizer! I’m serving fluffy pumpkin dip with your gahram crackers made into sticks and gf crackers with this cranberry salsa on cream cheese recipe I recently ran into for apps. This may be a good addition to round it out. These are gorgeous. They look just the way a nice, cheesy breadstick should look. I read your blog posts early, but like to look back and see which ones got a lot of comments. This is going to be one of them. People are going to go crazy for this!! You’d be surprised, Donia. Some of the most popular recipes on the site get the fewest comments. I used to wonder about it, try to puzzle it out, but I’ve given up!